The G21App adds an exciting new way to collect the raw sound files in the field that are used in the Gilbert 21 paradigm to make biological records. It brings the versatility and power of a dedicated data logger within the reach of anyone with an Android phone without having to pay for, and carry, a separate data logger. For information on how to set up automatic transfer of sound files from smartphone to Gilbert 21 Desktop, see the instructions here. The app should work on relatively early versions of Android. The 'min SDK target' is set at 9 which corresponds to version 2.3 (Gingerbread). I have only tested it on a physical device running 4.1 (Jellybean). Download the zipfile to your computer to give you a single file: G21App-debug.apk. Copy the file G21App-debug.apk to a folder on your phone's SD card. Ensure that your phone has Settings->Security->Unknown sources checkbox checked (necessary when installing from sources other than the Play Store). Use a file manager app on your phone to browse to the folder where you copied the apk file and select it. You will be prompted to install the app. If you are replacing a previous installation, first use your phone's app uninstall features to remove the previous version. The app will install and you will find a 'Gilbert 21 App' icon on your phone. 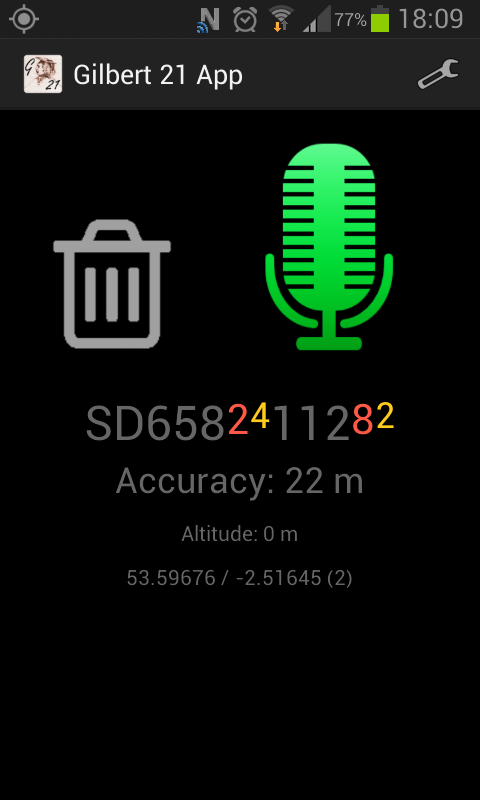 To make a geotagged recording, tap the microphone image. It will turn from green to red to indicate that the phone is recording your voice. Tap it again to end the recording. You have a geotagged sound file that the Gilbert 21 desktop software can read and play. When you first start the app, the microphone image may be grey, indicating that the phone does not yet have a reasonable fix on your location. It should never take very long to get a fix because the app uses Google's 'fused location provider' which means that it seamlessly uses GPS, the mobile phone network and Wi-Fi networks to get a location. However because the first fixes, using mobile phone network for example, might be quite innacurate for the purposes of biological recording, you should pay attention to the 'accuracy' readout on the app's interface and wait for an acceptable accuracy before you start recording. If you decide that you want to end a recording without saving it (for example if you have started recording by mistake), just hit the bin icon (which turns to orange when a recording is in progress) to end the recording and delete the sound file. Sometimes it can be useful to have an instant playback of a recording to satisfy yourself that what you've said is audible (e.g. in a noisy environment such as a vehicle). To do this, check the 'Replay on completion' option. When you have this option checked, the recording will be automatically replayed as soon as you've ended the recording and the Gilbert 21 App has saved the file. When it is replaying a recording, the microphone image is replaced by the speaker image shown here. If you don't want to hear the entire replay of a recording, just tap this speaker image to end the replay. If your phone has a hardware button to turn the screen display on and off, you can make use of this to stop and start recording. To to this, go to the options menu which you reach via the little spanner on the action bar (to the right of the G21 icon). Check the option which says 'Record on wake'. Return to the main app interface. Use your hardware button to turn off the display. Use it again to turn the display back on, you will notice that the app starts recording automatically without you hitting the microphone image. You can end and save the recording by hitting the microphone image, or simply by using your phone's hardware button to turn the screen display off again. With this mode of operation selected, it is very likely that recording will be initiated as some point when you don't want it to be. This is where the using the bin image to stop a recording and delete the associated file is particularly useful. You can also select an option ('Use shake') to enable you to start and stop recording by shaking the phone. You can alter the sensitivity of the phone to shaking for this app with the 'Shake sensitivity' option. An option allows to to select the output file type for the sound files. You can select either WAV which is uncompressed or AMR (3gp extension) which is compressed. The problem with AMR is that there is very poor support for the format on Windows. I had to download a third party application in order that I could initiate playing AMR files via the Gilbert 21 desktop software (VLC media player). I think that it's better to use WAV. Note that all the geocoding and time information is stored in the filename. 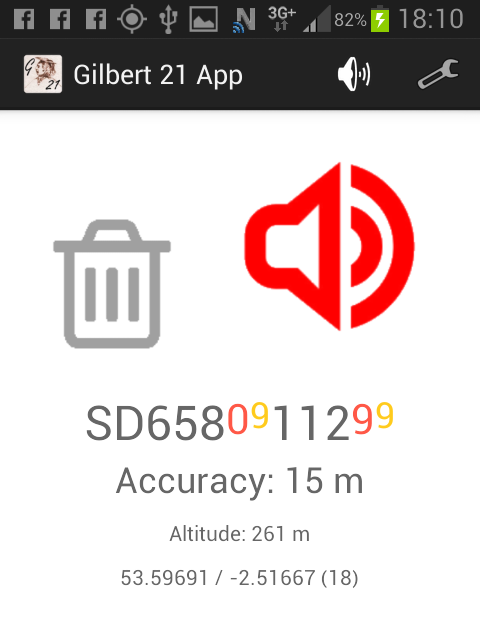 The G21App doesn't need a track file to match a sound file to its location. This is an important difference between the app and the Columbus/Visiontac datalogger. Files are saved to the apps private storage area which on most phones will be: 'Phone\Android\data\uk.org.gilbert21.app\files'. So to use them in in Gilbert 21 Desktop, you need to transfer them to your computer. You can do this manually with file manager programs, but I have had some success by using a third party app to synch this folder on my app with a cloud storage folder on my app. That way the files get uploaded to my computer - ready to use with Gilbert 21 Desktop - via the cloud without me even thinking about it. There are a number of other options which, according to the way you like to work, might be more or less useful. There's an option for darkening the display (just changes the app's background from white to black). There's an option that will keep the GPS running even when you've quit the application - so that when you start it again it will be able to get a quick GPS fix. (I normally just prefer to keep the app running when I go out for a walk.) Finally there's an option to keep the screen alive. If you click on little speaker icon on the app's action bar, you will be taken to a screen where you can review and manage recordings that you've already made. Three shots of this screen are shown below. The first shows a list of recordings stored in the app's file folder. Each sound file is represented by a line in the list which displays the OS grid reference (8 figure), the date and time of the recording. To play the recording, just tap on it; the green speaker icon turns red and the recording is played back. To interrupt the recording, just tap it again. 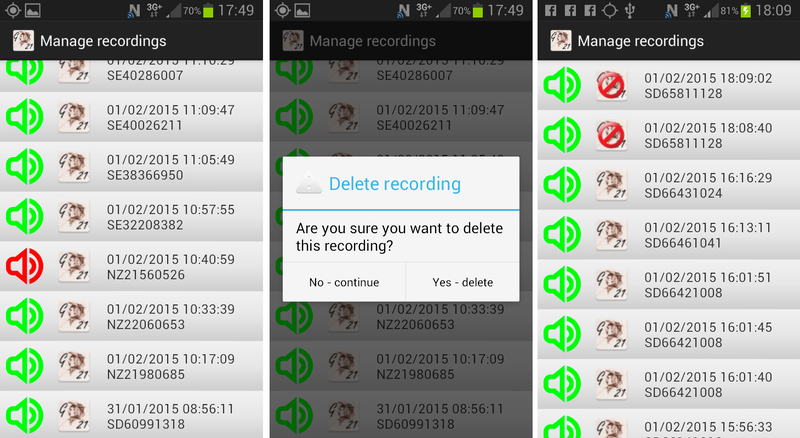 To delete a recording from your app's file folder, tap and hold the file (long-press) and a dialog box appears asking you to confirm the deletion. The image on the right shows a couple of files (at the top) with a G21 icon that has a red 'no entry' symbol superimposed on it. This signifies that the file name format option specified when this recording was made was not 'Gilbert 21 compatible'. If you are not a user of Gilbert 21 desktop, this needn't bother you, but if you are a user of Gilbert 21 compatible, this is a warning that the file will not import into Gilbert 21 (in the current version). If you check the 'Allow tracking' option, two more images appear at the bottom of the apps main screen. You can use the GPS symbol to start and stop tracking at will - creating as many separate track files as you like. When a tracking file is being created, this image turns red. You can stop the tracking by hitting the red GPS symbol. You can stop tracking and delete the associated tracking file by hitting the bin symbol adjacent to the GPS symbol. The tracking files produced by the app are not like the tracking files produced by the Columbus/Visiontac data logger - they have no use in Gilbert 21 Desktop. But they are standard GPX format files which can be understood by many tools such as Google Earth or QGIS. The GPX tracking files are stored in the same folder as the sound files and have names like this: 2015-01-24_20-54-58.gpx.